Coming in at £59.99 the Cooler Master MM830 goes above and beyond the expectations we set for it. Though the 96x24 pixel OLED display is lacking any real use cases it is a nice option for personalisation, though of course if it were not included it would bring the price down further, making the value proposition that much sweeter. If you've used a Cooler Master mouse from recent times the PBT plastic that is used will feel very familiar, it brings with it a great grip and a high degree of control that some smooth mice lack. The stand out feature that we feel needs to be called out is the “hidden” D-pad buttons, though not very hidden we found that the extra options for key bindings were very useful and we can see scope for use outside of the games we tested the MM830 with, for example in DOTA 2 for your skills or indeed the ever popular Fortnite. Another call out feature is that the software Cooler Master has developed for this mouse is outstanding, the amount of customisability in terms of lighting, the performance settings available, the OLED display and the options for macros means that the feature set here is second to none and really deserves commendation. The only negative around the software is the fact that you can't control each RGB zone independently which is not a big loss, but the option would be nice. The build quality on the MM830 is above our expectations at this price point, it features a gold-plated USB connector and braided cable, the scroll wheel spins smoothly with just enough resistance to not be loose which we appreciate, and every button on the mouse responds with a nice tactile click when used. 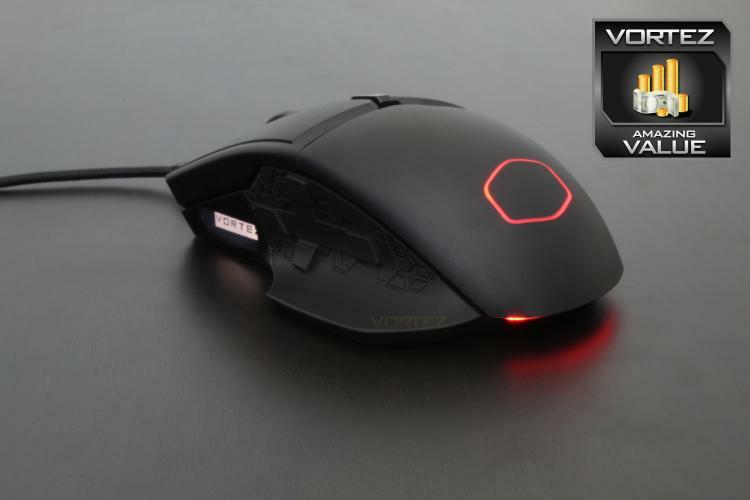 For the features included with this mouse to be available at £59.99 is a great achievement from Cooler Master and we feel that the MM830 is worthy of our Amazing Value award.